Candy and Food is the second most important planned purchase category during the Holiday Season. According to a survey done by Prosper Insight, as high as 56 percent of consumers planned to take advantage of offers that are available by way of Price Discounts on non-gift items during the Holiday Season. 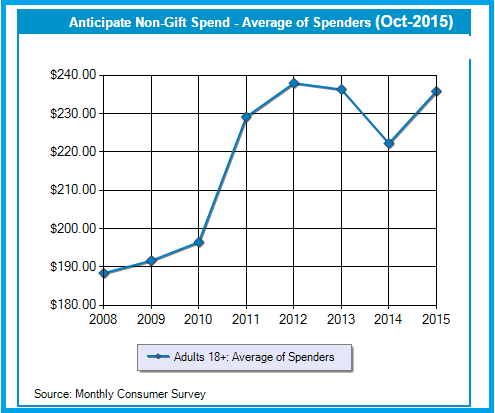 All spenders spending during the Holiday Season anticipate spending USD 230 during the holiday season on Non-Gift items, with as high as 90 percent planning to buy Candy and Food. Food Retail Brands and Food Brands targeting the Holiday Shopper with Product Offers, Content Marketing and Social Media posts have engaged the Non-Gift Holiday Shopper on Social Media Channels with Content and Holiday Season Packs. Krispy Kreme “Day of The Dozens Offer” is one of a kind offer that gives shoppers the ability to redeem an offer from a Facebook Post. The offer can be redeemed online with an email sent directly to the shopper. Krispy Kreme’s Day Of The Dozens offer gives a dozen doughnuts free with the purchase of a dozen doughnuts. 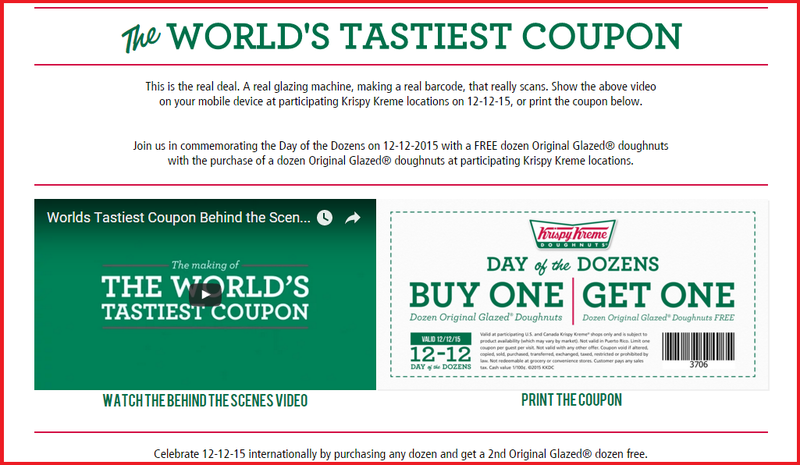 Titled the World’s Tastiest Coupon can be redeemed on Dec 12, 2015. The social media conversation for the offer can be followed on #DayOfTheDozens. The offer is mailed to the user from Facebook Offers for customers who click on the CTA in Facebook post and can be claimed online and shared on Facebook. Key Takeaway: Launch a limited time offer with a seamless shopping experience that is likely to best resonate with your audience, while they are out gift shopping. 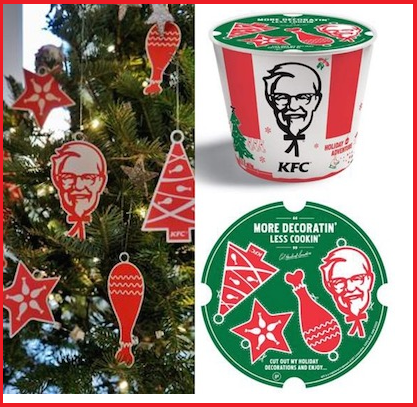 Kentucky Fried Chicken introduced Seasonal Packaging to add holiday cheer for customers looking at adding festive spirit to their meals, complete with Christmas decorations and all that is required to get you in the holiday mood. KFC has introduced Door Delivery services with Door Dash on Demand. DoorDash will deliver from KFC restaurants in the San Francisco Bay Area, Los Angeles and Orange County, with delivery expanding to other cities in the coming months. Kentucky Fried Chicken has earlier made a splash with Colonel’s Road Trip during Macy’s Thanksgiving Day parade. Key Takeaway: Launch a limited time holiday season packaging that is likely to best resonate with your audience to evoke emotional connect within a context. Increasing social media engagement with planned events can remind audiences about the role of your products in your customer’s lives. McDonald’s launched the next phase of All Day Breakfast Campaign with GIF Tweets that make All Day Breakfast appropriate for meals all day long, with the tagline Get Breakfast anytime. McDonald’s reintroduced Holiday Pies for a limited time, engaging audiences with a product that is likely to resonate during Holiday Season. As reported by AdWeek, Mc Donald’s has seen success with the launch of All Day Breakfast, successfully straddling the Lunch segment, with Breakfast menu items. A new study by market researcher NPD Group marks some of the first available data regarding the fast food chain’s all-day breakfast, the Wall Street Journal reports. The study found that a third of McDonald’s customers who bought breakfast beyond the previously established hours had not patronized the chain in the month prior to the initiative’s October start. All-day breakfast went into effect two months ago after McDonald’s CEO Steve Easterbrook implemented the plan to meet customers’ demands. NPD used receipts from over 27,000 survey participants in the month before and after the launch to determine its results. Most survey participants who ordered breakfast did so during lunch hours. The new initiative tended to boost the overall cost of the meal, as 61 percent of those customers also ordered lunch items, according to the study. Key Takeaway: Extending your campaign at the time when audiences are exploring options helps your content get discovered and can be an appropriate moment to remind them about any new products that you have on offer. Hershey’s Kisses has created a series of engaging Social Media Tweets with DIY Content ideas, Recipes and GIfs that remind the social shopper anout the products in a holiday marketing context. Entertaining is a segment where Food brands can use interesting and engaging content for non-gift holiday shoppers. Key Takeaway: Promoting your content on social media channels can increase interactions for your brand while they are gift-shopping to convert new customers for your brand with engaging non-gift content. Starbucks reintroduced “Starbucks for Life” offer on signing up for the Loyalty Program, “My Starbucks Rewards” . The program encourages sign up for the Loyalty Program at the time the audiences are most likely to be looking forward to offers for the socializing trend marking the shopping season. Wendy’s Social Media Posts remind audiences about the 4 for $4 meal which serves as a reminder for the shopper or the customer looking for non-gift shopping options, while they are out Gift-Shopping. Dunkin’ Donuts introduced JetBlue Tickets for the season with packaging that gets the users in Holiday mood with contest prizes that are targeted at engaging the non-gift spend from the Holiday Season Shopper. Posted in Advertising, Brand Strategy, Consumer Engagement, Content Marketing, Digital, Social Media. Tagged Campaign, Digital, Facebook, Hershey's Kisses, Holiday Season, Jet Blue, KFC, Krispy Kreme, McDonald's, Non-Gift Shopping, Social Media, Starbucks, Video Advertising.